Elfin Patch: Now where on earth did I get that. Now where on earth did I get that. That is what I thought when looking at my big ol' lumps of fabric in my stash, suitable for backings. Still not sure where it came from but it is just perfect for backing the Egyptian quilt. I needed something to give it a warmer look, as it is a very cool quilt, (temperature wise) to look at, all white and aqua. So the quilt was duly basted, and I have started to quilt it. I really wanted to hand quilt it, but having spent lots of pennies on my new machine with it's big throat, I thought I ought to bite the bullet and machine quilt it. At the moment, I am just outlining the triangles. Now isn't that shot rusty orange just right for this quilt ? 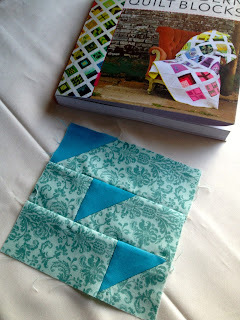 Who ever gave it to me, "Thank You "
I have (bought yet other new book, Tula Pink's City Sampler (100 modern quilt blocks). 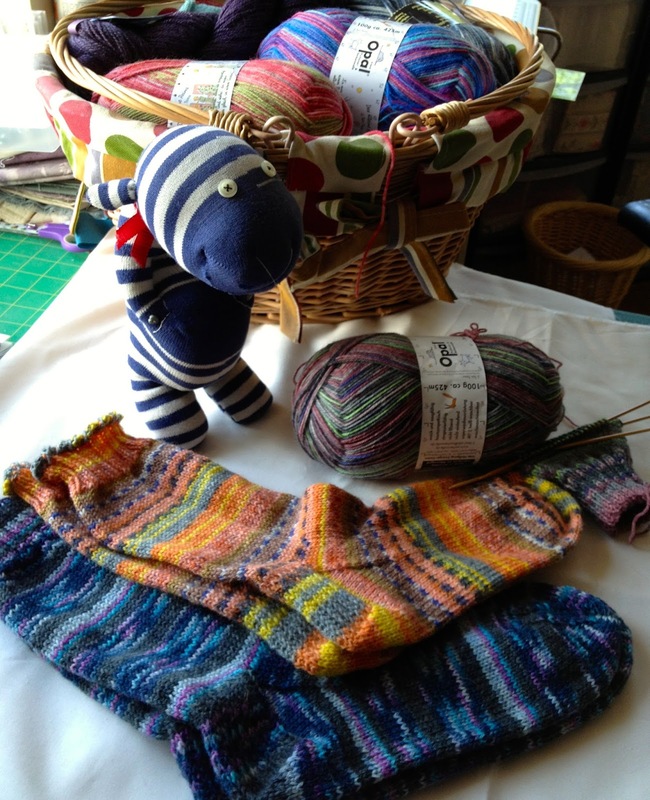 I joined an online quilting Bee and it seems everyone is making modern blocks, so I had better keep up to date. Ha! 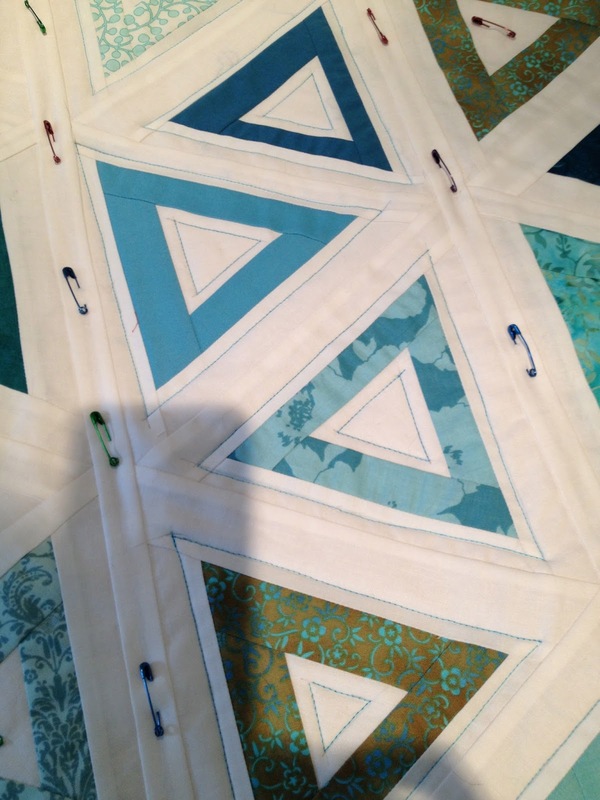 I think I might be the oldest quilter in this group. I have made one of the blocks from the book so far, with some scrap fabric from you know where. It's 6 1/2" square and, yes, it's quite nice. 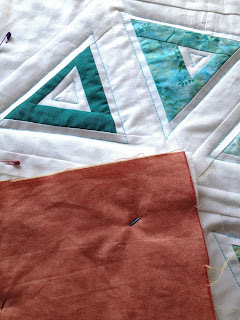 My intention is to make up blocks from scraps as I go along, then possibly I will have a sampler quilt at the end. I have to show you my sock buddy, with the "Christmas Socks" to date. I am now on the third pair, I seem to be all behind this year. A bit like this blog post, life gets in the way sometimes.